Nordic Tuning – What is this? Professional structural grinding on a modern world cup grinding machine, the Tazzari RB23, which is unique in central Europe. 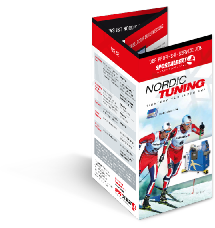 Together as a Nordic Tuning package – makes your skis faster! The following points will provide you with useful hints and information on our products. Do you have any questions? » Contact us. 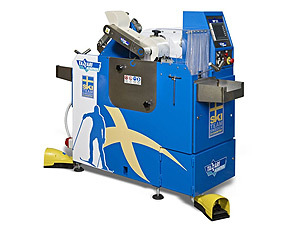 Nordic Tuning is the combination of plane grinding of the running surface of the skis plus structuring by stone grinding and the thermobox treatment. Over time, the running surfaces of the skis wear down round on both sides (figure 2) – they are not anymore exactly plane as brand-new skis (figure 1). By plane-grinding, we achieve this important basic state and, in this context, the condition for all structural grindings. By ironing with waxing iron, the small amorphous areas (good capacity for absorbing wax) melt with large crystalline areas (dull, almost no capacity for absorbing wax) and make the running surface slow and dull (figure 3). Due to the grinding, the structure of the running surface changes. With regard to new or freshly grinded running surface of skis (figure 4), large, perfectly sliding, amorphous areas develop, which have a large capacity for absorbing wax and only a low number of crystalline parts. First of all, the ski is grinded plane by numerous grindings in different programmes at our house. Afterwards, the skis are ready for the structural grinding, which differs depending on the temperature and the type of skis. During the thermobox treatment, which follows the grinding process, the surfaces are at first manually cleaned from the residuals of the grinding by using a special cleaner. Afterwards, the skis are manually waxed with quality thermobox special wax and are stored in the box in several thermobox cycles at various temperatures for several hours. This procedure opens the pores gradually. Thereby, large, amorphous pores, which are opened by the grinding process, can optimally absorb the wax. 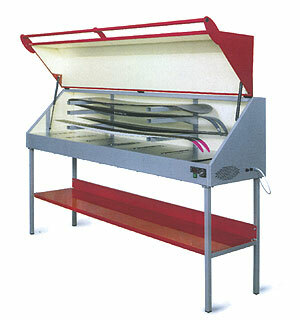 In this respect, no shock sealing takes place, which is the case for waxing with waxing iron. Due to the fact that it is very gentle and guarantees a maximum wax absorbing capacity of the running surfaces, Lars Svenson calls his thermobox treatment »a holiday on Mallorca for the surfaces«. Finally, the treatment of the ski has come to an end. Being equipped with this wax layer, the skis are delivered to you. The only thing you have to do is to peel off and brush away the wax, and, if necessary, prepare the skis with the required wax used at the day of usage.